Journey was originally slated to launch late last year. This unique game will probably be unlike anything most of us have ever played. Thatgamecompany held a private beta for fans, received feedback and decided to push the game a bit in order to make improvements. Improvements have been made and thatgamecompany has officially announced a release date for their whimsical experience, Journey. The PlayStation Network game will launch on March 13th, a little over a month from today, and it will sell for $14.99. 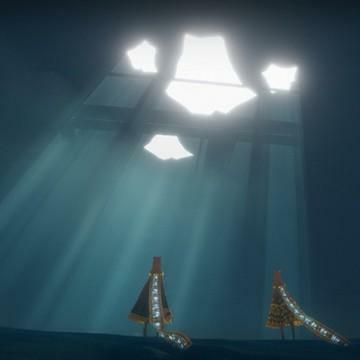 We interviewed the composer for Journey, Austin Wintory, towards the end of last year. Go ahead and give that a read if you find yourselves a bit more interested in this title, we talk all sorts of moody goodness. You wake alone and surrounded by miles of burning, sprawling desert, and soon discover the looming mountaintop which is your goal. Faced with rolling sand dunes, age-old ruins, caves and howling winds, your passage will not be an easy one. The goal is to get to the mountaintop, but the experience along the way is discovering who you are, what this place is, and what your purpose is. Travel and explore this ancient, mysterious world alone, or with a stranger you meet along the way. Soar above ruins and glide across sands as you discover the secrets of a forgotten civilization. Featuring stunning visuals, haunting music, and unique online gameplay, Journey delivers an experience like no other. Thatgamecompany also released Flower and flOw. Will you be downloading and checking out their newest original piece when it drops this March? Or, are these games not for you?